EECP is a non-invasive nonsurgical treatment for angina pectoris by increasing coronary blood flow in ischemic areas of the heart.EECP encourages blood vessels to open small channels around the narrowed or blocked arteries which eventually become"natural bypass" vessels to provide blood flow to heart muscle that will relieve or eliminate angina. It's also widely used in coronary heart disease,male functional sexual dysfunction,early high blood diseases,high blood sugar and poor blood circulation caused vertigo,dizziness,cervical spondylosis and physical fatigue. It's popular installed at home,hospital,clinic,rehabilitation centres,fitness clubs,etc. 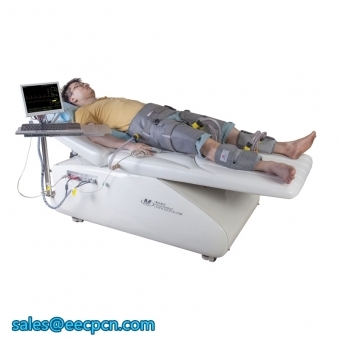 While EECP is performed,you will be lying on a bed wearing a series of pressure cuffs around calved,lower thighs and upper thighs.The EECP system includes a pressure source that inflates and deflates these cuffs, the pressure moves the blood from your lower limbs toward the heart.Each wave of pressure is timed with your heartbeat via ECG signal.So that the increased blood flow is delivered to your heart at the precise moment when heart relaxing.When the heart pumps again,the pressure in cuffs is withdrawn immediately.This lowers resistance in your legs so that blood pumped more easily from the heart. 1.Compressor adopted is Gardner Denver imported from Germany,stable and durable.with a lifetime more than 50,000hours. 2.Customized valves special for EECP machine,quick reponse,low temperature and low working noise,lifetime more than 25,000hours. 3.The deflation and inflation time can be adjustable based on different patients. 4.With customer managerment system,can save and print out each patients data. 5. With"demostrate function",will automatically check whether all systems are properly working before doing treatment for patients. 6.Real-time ECG and SpO2 monitor function during treatment,showing the D/S ratio,intuitive observation of treatment effect. 7.It adopts scientific designed system to reduce noise and heat. 10.Stable software system:Embedded software system,virus can’t attack. 11.The angle of the backrest can be adjusted on the basis of patient's physiological situation. 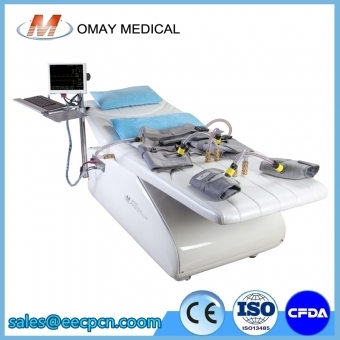 12.Omay EECP: got CE,ISO13485 and SFDA. 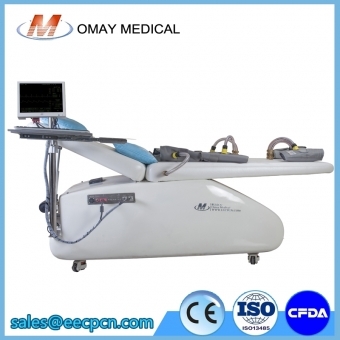 1.All the control in the therapeutic process is executed by the computer(automatic therapeutic machine), which simplify the operating process. 2.The patients’ ECG and paulse signal are processed by special module. It uses the wiring installation designed for EMI, with excellent circuit performance, high stability, strong capability of anti-interference. 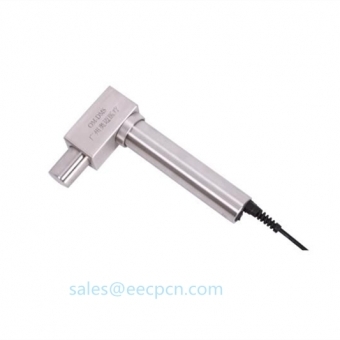 3.High-quality parts and components are used in this EECP machine ,such as solenoid valve and air-compressor, which ensures the reliability of the whole device. 4.It uses LCD, which is harmless to the operators. Besides, the whole display area can not only show patient’s name but also real-time show ECG waveform, pulse,blood oxygen saturation,treatment pressure,and can freeze down and save the whole screen for observation without affecting the treatment process. 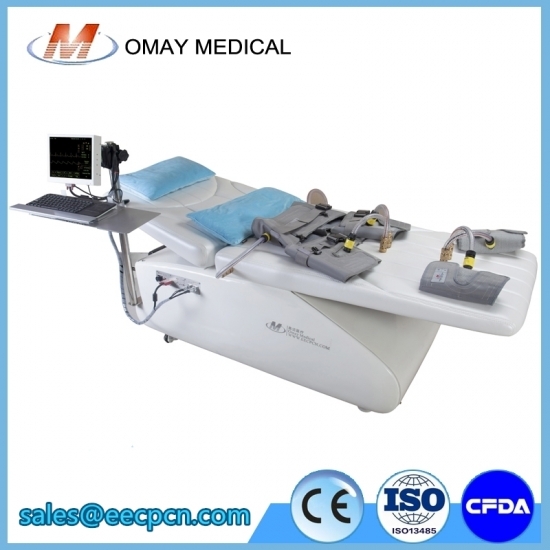 5.While doing EECP treatment,Omay EECP machine can automatically measure and calculate the peak and area ratio of diastole wave and systole wave, and can real-time display to help evaluate, analyze and summary the effect of the treatment. 6.It has a variety of auto-safety protection. 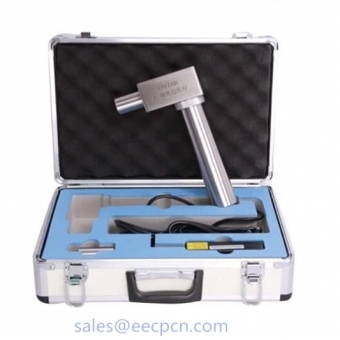 When the heart rate of patients grow too fast or slow, the pulsation is too early, or the exhaust is too late due to the inappropriate regulation, it can adopt protective measure to prevent the patients from being hurt. 7.The connection of cuffs and bed relies on the poison-free, wear-resistance tube and non-toxic non-metallic joints. It is simple and fast to install and uninstall the tube and cuff, which is convenient for the operator installation and maintance. 8.The inside of EECP bed use the shakeproof and noisedamping materials. It runs smoothly and quietly. 9.Three different sizes of Cuffs for Calves, lower and upper thighs. 10.Treatment Timer is provided for setting the treatment session and the device stops automatically on the expiry of the “set” time. Omay Medical Technologies Co.,Ltd is a manufacturer of EECP production since 2008. “Customer first,quality foremost" is our objective since establishment.Our company is equipped with professioanl design team,experienced management,excellent after-sales service term,R&D and QC.All producing process strictly follows the ISO9001 quality standards and our EECP got CE,ISO13485,SFDA and Free sale certificates. Our chief engineer Dr.Zhou,a M.D. at heart diseases and bio-med engineering PhD,who persued his PhD at Sun Yat Sen Universityduring 1995 and 1998 with Pro.zheng zhen sheng as his tutor(Pro.zheng zhen sheng is the father of EECP in the world,designer and shareholder of Vasomedical EECP machines). Advanced technology,competitive price and high quality accessories imported from Germany make Omay the best choice for you.